Pure Silver Gold-Plated 5-Coin Set - Legacy of the Dime - Mintage: 3,000 (2018). For added historical accuracy, each reverse design is paired with its original obverse! A brand-new, unused, unopened, undamaged item in its original packaging (where packaging is applicable). A MODERN TRIBUTE TO PIECES OF HISTORY! The story of Canadas 10-cent coin is in part the story of the Royal Canadian Mint. Time after time, history has left its imprint on this beloved coinfrom unusual strikes to commemorative issues. This five-coin set is a retrospective look at the designs that have adorned our smallest-sized circulation coin. 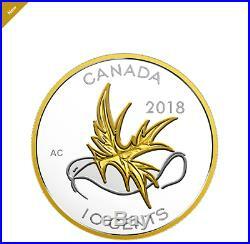 Paired with the original obverse, each selectively gold-plated coin is crafted from pure silver and measures at least twice the original sizeespecially the larger-sized two-ounce coins, which both bear the mark of a world event that forever changed the face of Canadas dime. Your Legacy of the Dime five-coin set traces Canadas 10-cent coins rich history! Your five-coin Legacy of the Dime series traces the history and evolution of Canadas 10-cent circulation coins issued by the Royal Canadian Mint. All five reverse designs are beautifully re-created here in 99.99% pure silverincluding two 2 oz. Replicas of 10-cent coins that came to be amid unusual circumstances. Selective gold plating stands out against the mirror-like proof finish, and highlights the engraved relief on both the reverse and the obverse. TWO SIDES OF THE STORY! For added historical accuracy, each reverse design is paired with its original obverse. Each coin in this set is at least twice the size of the original issue. Brought to life on a larger scale than ever (38 mm and 54 mm diameters), every detail in these engraved designs catches the eye and brings renewed appreciation for these familiar images. While the iconic art is unchanged (save for the updated year), each design is enhanced by the use of modern finishes that further highlight the sculpted elements. Packaged side-by-side in an elegant case, your five coins touch on several key moments in the history of the Royal Canadian Mint. Its an exquisite addition to any history-themed and circulation coin collection! Your coin set is limited to a mintage of just 3,000 coins worldwide. The Royal Canadian Mint certifies all of its collector coins. Most of these are serialized certifications, meaning that each certificate is given a unique number, starting at 1. Your five coins are designed in 99.99% pure silver! Your 5-coin set is GST/HST exempt! 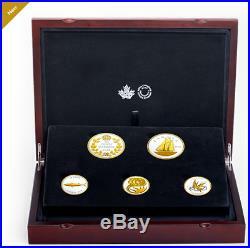 The five coins in your set are all crafted in 99.99% pure silver and feature Canadas 10-cent circulation coin designs. The 1936 Dot and the 1947 Maple Leaf 10-Cent coins have a diameter of 54 millimetres and a weight of 62.67 grams; the 1967 Centennial, the 2001 Year of the Volunteer and the 2017 Wings of Peace 10-Cent coins have a diameter of 38 millimetres and a weight of 31.39 grams. 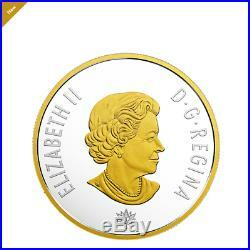 Selective gold plating highlights the relief on the reverse and obverse, which features the effigy of King George V, King George VI or Her Majesty Queen Elizabeth II, as they appeared on the original coins. Reproduced as a 2 oz. 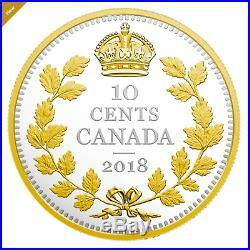 Pure silver coin, the exceptionally rare 1936 Dot 10-Cent coin features W.
Blakemores modified version of an original design by L. Edwards Crown, the crossed maple bough is a fixture on all Canadian 10-cent coins issued between 1858 and 1936. A small dot beneath the tied ribbon is the identifying mark of a coin struck with the old obverse during the transition from the reign of King George V to King George VI. 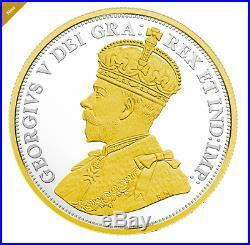 The obverse features the effigy of King George V by Sir E.
Also reproduced as a 2 oz. Pure silver coin is the 1947 Maple Leaf 10-Cent coin. 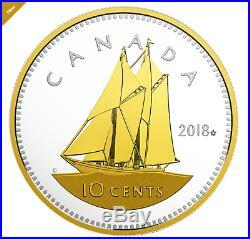 The reverse features Emanuel Hahns depiction of the famous Nova Scotia schooner, Bluenose, under sail. 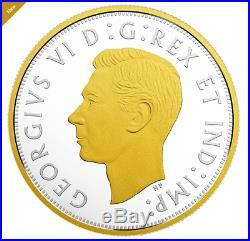 On the obverse, the effigy of King George VI by T. Paget includes the Royal Title GEORGIVS VI D:G:REX ET IND:IMP, which became outdated once India gained its independence on August 15, 1947. Included in this modern-day tribute is the small maple leaf that was added next to the year, to denote coins struck with the old obverse while the Royal Canadian Mint awaited new master tooling. Pure silver version of the 1967 Centennial 10-Cent coin features the beloved reverse design by Alex Colville. 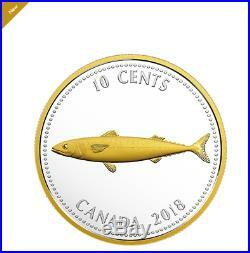 Designed to commemorate the 100th anniversary of Confederation, the image of a mackerel pays tribute to Canadas coast and represents the idea of continuity. Instead of the denticles seen on the 2 oz. A curving legend YEAR OF VOLUNTEERS ANNÉE DES BÉNÉVOLES separates the side-profile view of marching mothers and the sun below, whose rays symbolize a volunteers enlightening effect on their community. The obverse features the effigy of Her Majesty Queen Elizabeth II by Dora de Pédery-Hunt. The 2017 Wings of Peace is the most recent commemorative issue of the 10-cent coin. As part of the My Canada, My Inspiration collection commemorating CANADA 150, it features a reverse design by Amy Choi of Calgary, Alta. And highlights Canadas reputation as a peacekeeping nation. Instead of a traditional olive branch, the stylized dove clutches a maple leaf that stands as a symbol of hope, peace and good faith. 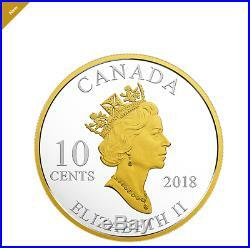 The obverse features the CANADA 150 logo and the effigy of Her Majesty Queen Elizabeth II by Susanna Blunt. 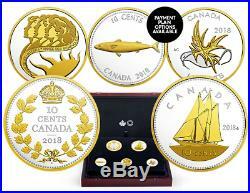 Canadas first decimal coins were introduced in 1858. Re-created on our tribute to the 1936 Dot 10-Cent coin, the crossed maple boughs design appeared that year on Canadas 10-cent, and from 1870 to 1936, on 25-cent and 50-cent coins as well. When new circulation designs were proposed in 1936, a mountain goat was among the ideas considered for the 10-cent coin! Ultimately, the decision was made to feature Emanuel Hahns now-famous depiction of the Bluenose schooner, but the face value was originally intended to take up two lines (10 above CENTS); in the end, the face value was engraved as a single line, as it appears today. A small maple leaf can also be seen on some coins struck during a limited production run in 1948, before the arrival of new tooling for the obverse. Unveiled by His Royal Highness The Prince of Wales, the 2001 Year of the Volunteer coin holds special significance for us: it was created by Royal Canadian Mint engravers, some of whom are still with us today! Your coin set comes packaged in beautiful wood collector's case with black beauty box. Blakemore (reverse), originally designed by: Sir E. Originally designed by Emanuel Hahn (reverse), originally designed by T. Originally designed by Alex Colville (reverse), originally designed by Arnold Machin (obverse). 2001 Year of the Volunteer. Originally designed by RCM Engravers (reverse), originally designed by Dora de Pédery-Hunt (obverse). Originally designed by Amy Choi (reverse), originally designed by Susanna Blunt (obverse). Artist Emanuel Hahn (reverse), Susanna Blunt (obverse). Composition three-ply nickel finish plated steel. Kruger Gray (reverse), Susanna Blunt (obverse). The item "Pure Silver Gold-Plated 5-Coin Set Legacy of the Dime Mintage 3,000 (2018)" is in sale since Friday, March 16, 2018. 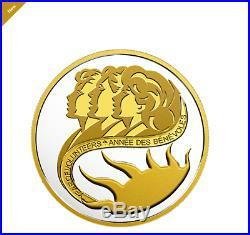 This item is in the category "Monnaie\Pièces - Canada\Commémoratif".impex" and is located in Verdun. This item can be shipped to Canada, all countries in Europe, all countries in continental Asia, United States, Mexico, Australia.